Ellie is training to be a dental nurse at our sister company MIDHS Dental Care. When not in surgery, Ellie helps with the order processing for VisionPerio. Ellie says she enjoys the mixture of roles and loves knowing that the brushes she sees being promoted and used in surgery so effectively, are being used across the UK and wider. She takes great pride in ensuring orders ae packed neatly before being checked, parcelled up and dispatched to customers quickly. Ellie lives locally and often goes for meals and going out for runs with her rugby partner. 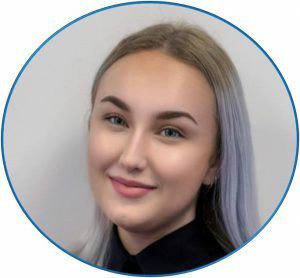 She is very sociable and has a great relationship with all the team at VisionPerio!